This is an A5 multi-paged booklet, supplied in PDF format, which can be issued to each new pupil to explain the factors involved in learning to drive with regard to the ‘background’ administrative details. By use of a logo, business card, letterhead etc. pasted in on the front cover, the document is immediately individualised to a company and for use by that company. This is probably the most comprehensive code available on the market and is designed to reassure pupils that their welfare is of paramount importance. At the same time, it allows the instructor the normal operating parameters with no undue constraints. 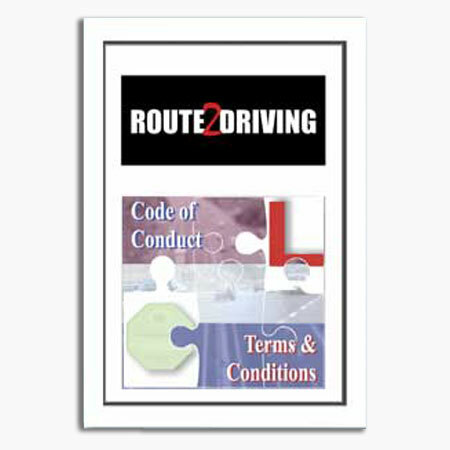 This is a fairly standard – but comprehensive – agreement affecting both sides of the learning to drive experience. However, it is more of a guide to the pupil than a constraint on both sides and nobody should feel any restriction in the course of instruction. The end user is allowed to copy the original master for their own use only and on the understanding that the copyright is invested in Ideas4ADIs and not the end user. The end user must ensure that the copyright details remain on all subsequent copies.